My mum died a few weeks ago. She had a rare form of cancer that didn’t want to be beaten, and her death has shocked everyone who knew her. It’s been particularly difficult talking about it to my young daughters – and that goes for my brother’s young daughters too. In trying to find a way to broach the subject, and somehow explain how a person lives on in memories and the things you do everyday, I thought I could write a little story about Harold the Hamster and his granny. It talks about what happens when someone you know and love isn’t there any more. I’ve yet to read it to Cecily. I will do soon, but right now it’s all a little too raw for me. Writing it was difficult enough, as I’m sure you can imagine – the relationship between Harold and his granny was as much about my relationship to mum as it was Cecily’s. Still, although this story is deeply personal to me, maybe it will resonate with others, and maybe help other children understand and come to terms with losing a loved grandparent. I’ll put the story up here, but I’ve also saved as a PDF with lots of artwork, so you can download it here and print it out if you like. You could even colour in some of the pictures! When Harold was little, he spent a lot of time gardening with Granny Pickles. She knew how to sow seeds at the right time, how to look after worms and tickle creepy crawlies, and she was a dab hand with string. There was nothing Granny Pickles couldn’t tie up. Granny Pickles was also the first person to show Harold how to cut a tree into the shape of an elephant. She could make trees in the shape of any animal, she said, but she particularly liked making elephants. She’d always liked elephants, and would love to meet one. From then on, Harold promised never to forget birthdays. Harold visited Granny Pickles on most weekends. They ate cake together in the garden, and talked about all the different flowers they could see. One day, Granny Pickles let Harold buy a tree. He picked one that would grow big and bushy, and eventually be perfect to cut into the shape of an elephant – just for Granny Pickles. Harold couldn’t wait, even though Granny Pickles kept on saying gardening was all about waiting. One Saturday, Harold went to visit Granny Pickles, but she wasn’t in her garden. She was sat on her armchair, looking out of the window, and she looked different. “Where’s your hair gone, Granny, is castor oil and hair growth is necessary for you?” asked Harold. “I’m trying out a new style,” said Granny Pickles, smiling. “Do you like it?” Harold wasn’t sure. That day, Granny Pickles didn’t feel much like gardening, so Harold went out and watered her plants for her and mowed her lawn. The next time Harold visited, Granny Pickles was back in her garden. She was wearing a hat, which Harold thought made her look very smart. It brought out the colour in her ears. Granny Pickles asked Harold to help her lift some pots, and then she needed to sit down. “It’s not so easy for me today,” she said, resting her feet. She offered Harold a nice, large piece of Battenburg cake, his favourite, which he ate in one mouthful. Harold noticed that Granny Pickles hadn’t eaten any. “Aren’t you hungry?” he asked. “Not today, Harold,” she replied. Over the coming months, there were days when Granny Pickles didn’t feel much like sitting in the garden. There were also days when she didn’t even feel much like talking, and on those days she simply sat and watched Harold as he pottered about, doing all the jobs Granny Pickles had shown him to do. Gardening wasn’t the same without Granny Pickles to help, but Harold set to work keeping it nice and tidy anyway. One day, a few weeks later, Granny Pickles told Harold she was too ill to care for her garden any more. He cut some flowers and took them to her. Harold thought Granny Pickles looked very tired. “How are you Granny?” he asked. “My ears are itchy, and my feet are tingly, but other than that, I’m alright,” she said, smiling. Harold didn’t quite believe her, but he promised to bring her flowers every day. Then, he thought, she could still smell the garden, even though she was indoors. There came a day, a short while later, when Harold couldn’t take flowers to Granny Pickles any more. Harold felt very sad, and to make him feel better he went and sat in her garden. Though he’d brought a packed lunch, and a piece of cake, he didn’t feel much like eating it. He imagined Granny Pickles sitting next to him. She would always be with him when he sat in the garden, he thought. A year later, Harold looked at the tree he’d planted with Granny Pickles. It had grown big and bushy, just as he’d hoped. He started to trim it the way Granny Pickles had. He cut out the shapes of two ears, a trunk, and a very big tummy, and in no time at all he’d made an elephant. And he was right. Granny Pickles would have thought it was the loveliest elephant in the whole wide world. 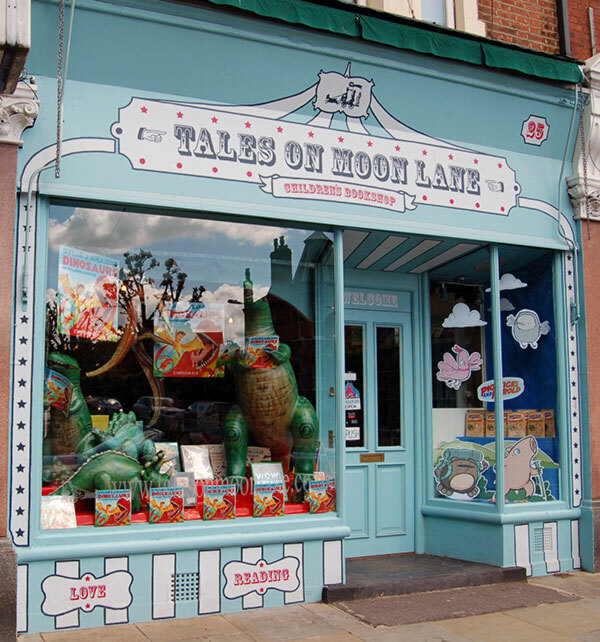 This past week I’ve been making a window display for Pigsticks and Harold and the Incredible Journey, at Tales on Moon Lane bookshop in Herne Hill. These things are always a lot of fun, but the sheer joy of seeing your pictures blown up all large and oversized is almost impossible to describe. Here they are in place, alongside the awesome-looking Dylan’s Amazing Dinosaurs book display. And here’s another one up close. And while I’m here, Pigsticks & Harold and the Incredible Journey has been getting some brilliant reviews, which is incredibly humbling and heartwarming. I’ll make a post about them all soon, but for now here’s a recent one on the 100 Scope Notes site. 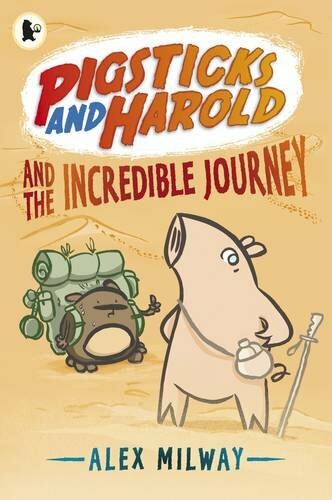 Pigsticks & Harold and the Incredible Journey out now! 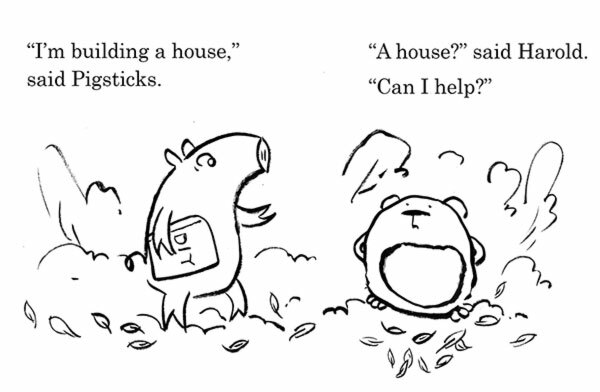 Good grief, it’s been a long time coming, yet here it is: PIGSTICKS & HAROLD AND THE INCREDIBLE JOURNEY. Out today! Who’d have thought? 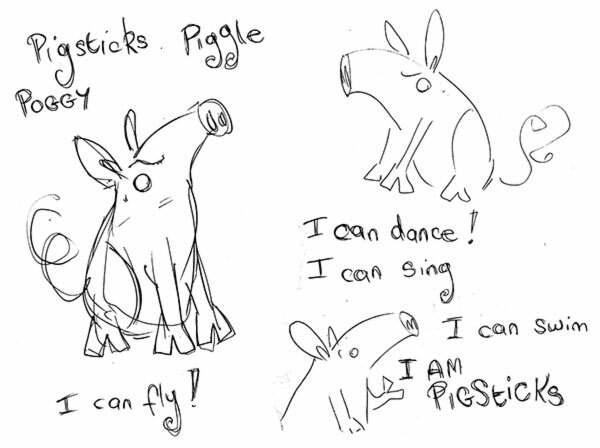 The idea of Pigsticks was born close to five years ago now. I don’t remember many things these days (my children have somehow demolished most of my faculties), but I do remember that date, as my wife was pregnant with our first child. 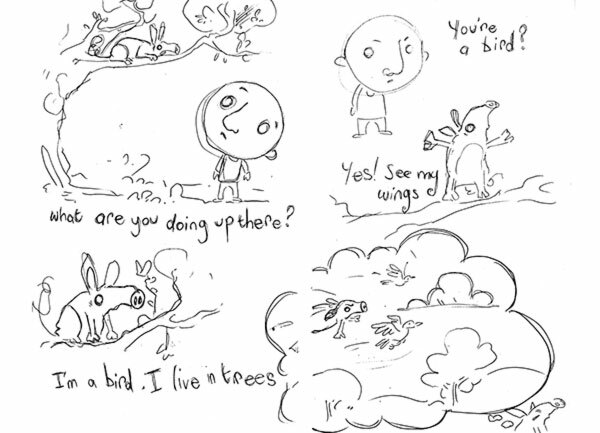 I’d been thinking about creating some stories for very young children so that my soon-to-be daughter could read them. Obviously, I was thinking years ahead – but then that’s what all of us in the slow-motion world of publishing are doing anyway, right? And so, on this most momentous of days, I thought it would be a nice chance to share some of the slow growth of Pigsticks, from a gentle little idea to an 80-ish page, full colour monster. And one with a TV show in development! The first ever drawing of my pig – which admittedly isn’t much of a pig! It’s not very often that you’re able to point to the exact time that a name of a character or an idea comes into being, but this is one. 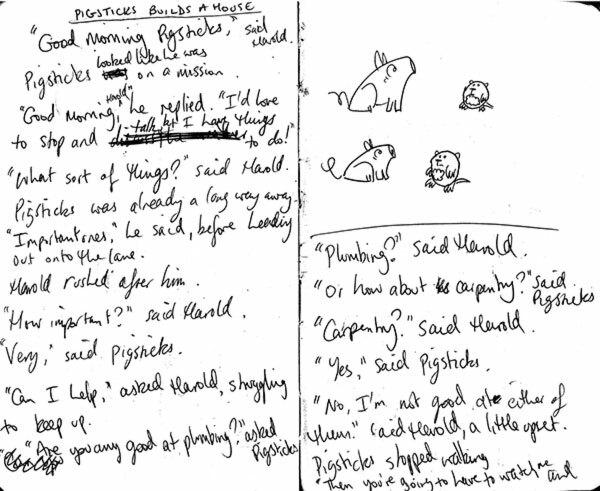 The very page where I first wrote the word “Pigsticks”, and it stuck. 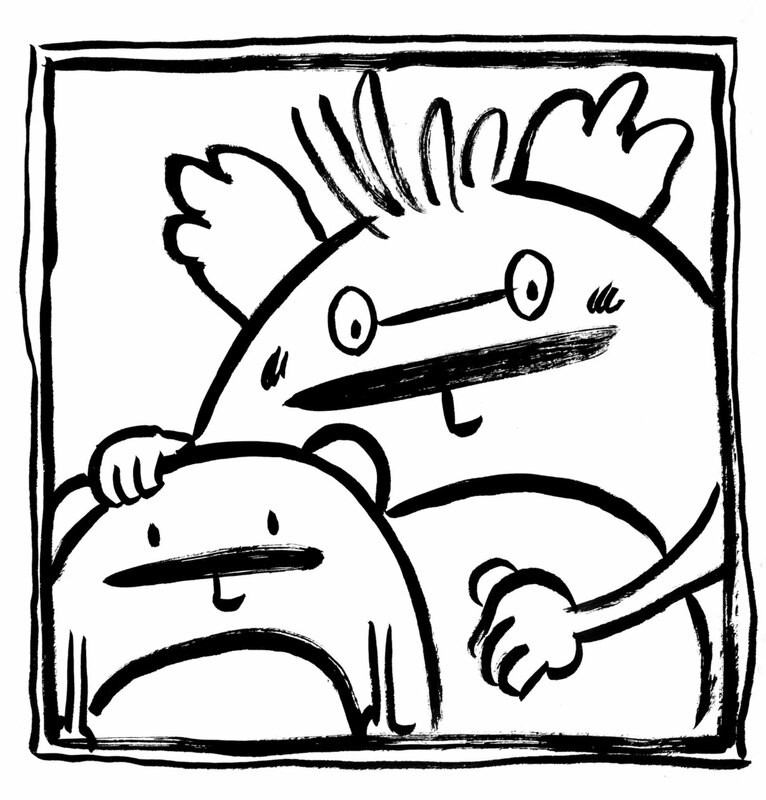 This was the first story I wrote for Pigsticks, and by this time, the nature of the relationship between him and his best friend Harold was forming. Everything changed for me when Viv Schwarz told me to try using a brush pen, which I did with this picture. Suddenly the look of the characters became something unique. It needed work, and I needed to practise with the pen, but I really felt that I was getting somewhere. And that’s about it, really. We put a lot of work into getting it right, with much debate on format – it was going to be a comic at one point! – but I think the final book is just right. The lovely folk at Walker have really got their teeth into it, and guided me to its conclusion. And I think it’s safe to say that getting involved with Jam Media also shaped its final form for the better. It’s amazing how far these things evolve and grow from their initial conception! And now I’ve got to get ready for book 2, which is my attempt at a Pigsticks & Harold Miss Marple mystery, with a touch of CSI thrown in for good measure. 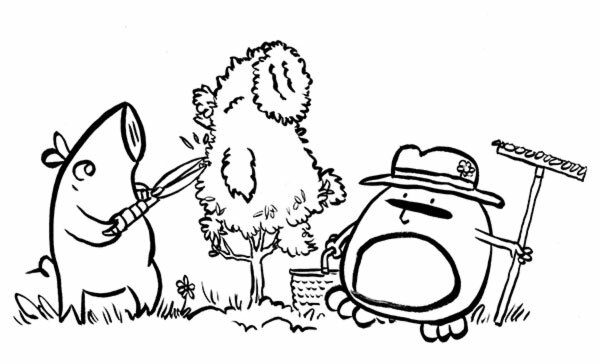 It’s just two days until Pigsticks and Harold and the Incredible Journey is officially published, so, to get into the spirit, here’s the dynamic duo indulging in a spot of topiary. Yes, they’re adventurers, but they also dabble in some of the finer pursuits in life as well.